After a successful, sold-out workshop in February, artist May Babcock is returning to the printshop this spring to teach another all-day papermaking workshop. Participants will learn a variety of hand-papermaking methods including basic sheet formation and pulp painting techniques. Students will be able to make as many sheets as possible over the course of the 8-hour class. May Babcock is a fine artist specializing in printmaking, papermaking, book arts and video. Babcock graduated from the University of Connecticut in Storrs with a Bachelor of Fine Arts in painting and printmaking. Directly after, she joined the graduate printmaking program at the Louisiana State University in Baton Rouge, earning her Masters of Fine Arts degree in 2011. She has taught courses in all forms of printmaking, papermaking, drawing and two-dimensional design. Babcock has exhibited work nationally and internationally, and also enjoys working collaboratively with her peers. She currently lives in Providence, Rhode Island. What first got you interested in papermaking? I went to graduate school at Louisiana State University for printmaking, which shares a space with fantastic large-format papermaking equipment. After working on a collaborative paper and woodcut print project with a fellow grad student (who specialized in sculptural papermaking), I was in love with handmade paper. From then on, I was making paper and pulp paintings together with my prints and book forms. What are the advantages of printing on handmade paper? Making your own paper is all about control over your substrate, visually and conceptually. 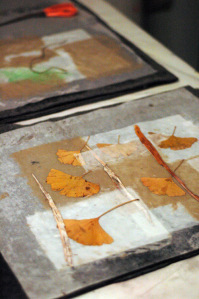 Creating handmade papers for printmaking adds another variable that you can play with. Decide the size, color, shape, texture, surface, opacity, dimensionality, weight…the list of techniques and possibilities are limitless. Also, the fiber you choose for your paper can carry meaning, meaning that can expand and intensify the content in a print or artist book. For instance, paper can be made from recycled clothing, plant fibers from specific places, and reconstituted papers. Paper has the potential to be something more than a static surface, allowing a print to become a physical object for deeper contemplation. How accessible is papermaking? Will students be able to use these techniques at home? Papermaking can be surprisingly simple! With just a few basic pieces of equipment, almost anyone can start making handmade paper in their kitchen, basement, or backyard. 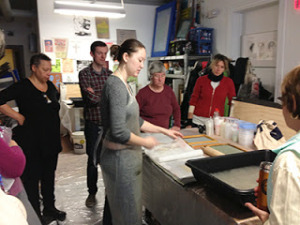 I make a point to include a “how to make paper at home” lecture in workshops that don’t take place in a paper studio. Most are items you might already have, or that you can inexpensively make yourself. Of course, with more specialized papermaking equipment, one can create higher quality papers, larger quantities, bigger sheets, and use a wider range of techniques with greater ease. How does making your own paper tie into your own artistic process? Much of my work begins with a specific site, where I collect materials and draw the surroundings to gain a psychological impression of a place, and poignant evidence of human activity. As a printmaker and papermaker, I like to see my work as an adventurous hybrid between the two processes, and experimentation in the studio invigorates my artistic process. The collected fibers turn into paper pulp, pulp used for casting carved woodcuts and forming irregular sheets for prints and book-forms. For instance, in South Louisiana I made bagasse fiber paper (bagasse is leftover from processing sugar cane) for large-scale woodcuts of abandoned sugar mills, and other rusting remnants of agriculture and commerce. Recently, I have been intrigued by Phragmites australis, an invasive aquatic plant in Rhode Island, found along shoreline sites disturbed by construction, ditching marshes, and other interruptions in the landscape. 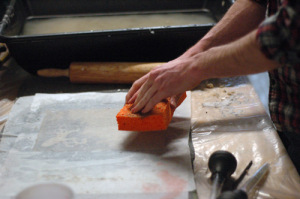 The next Papermaking workshop will take place on May 25th from 10am to 6pm. Be sure to visit the AS220 Shop class description and reserve your spot today!